it laps it up and roars for more. Blowing chicken soup with rice." The extra-large apple weathervane is now nearing completion, with the leaf and stem fixed in place, and only the arrow left to attach. We starting assembling the cardinal letters (N,E,S, & W) yesterday, finishing this morning & then headed into Hereford to collect the last bits of kit for next weeks demonstration. The city was considerably quieter today than yesterday when the Queen paid a visit! We are also looking at woodstoves for the studio and are interested in the Relax range of workshop stoves. I guess it all started with looking at Deom Turbos mentioned on a French blog...I think the Deom is from the Netherlands. I would love to hear from anyone who has used one. 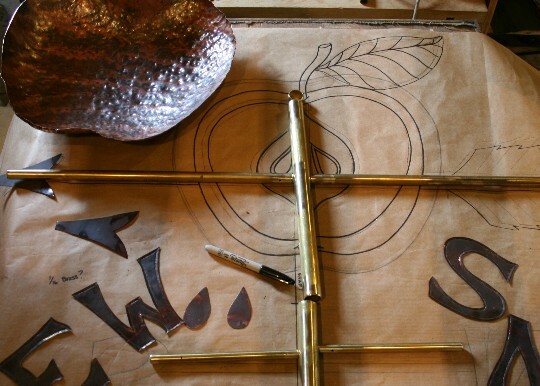 The first two layers of the apple's core are now fixed to the brass mainshaft of the weathervane. There is still quite a lot of work to be done, like filling the large gap which can be seen down the left side. 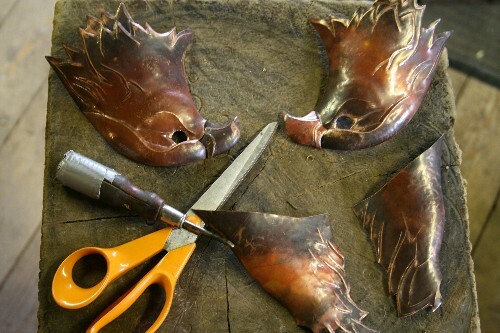 Once closed however, the copper parts should assemble quite quickly...all in time for Art in Action in 10 days time? So much to do! The weekend was a frenzy of activity, moving the office into it's new space. Went to hear Finn Mackay at the Globe in Hay-on-Wye, and then visited painter James Ursell at his new studio/home in the Golden Valley with it's sweeping views over the Black Mountains. We are still working hard planning our metalsmithing courses for the fall. In anticipation we are finishing insulating the studio & rendering walls. Bits of of plaster and dust keep showering down on me today as "Gordon & son" get cracking on the upstairs. This evening we have a big packing job, as the Montagu's Harrier Hawk is back from the museum and off to it's new home. The Trotting Horse will follow on Thursday. The apple weathervane is chugging along! The "body" is now primarily smoothed, although it is never easy to know when to stop and just be happy. The two halves of the large three-dimensional leaf are brazed together with a "rough" edging, giving the leaf a ragged, chunky outline. The leaf has been designed to be smooth and rounded on one side (the side depicting the core of the apple) and deeply veined on the side with the whole apple, creating a striking contrast between the two sides. All our attention is now geared toward the apple's core, and trying to get the chisel detail of each layer to emanate it's own character. The first layer is being developed with a ball-pean "ding" pattern which should shimmer in the light. This seemed to be a nice reference to the inside of the apple being white. The ball-peaning stretches the copper, causing it to curl (which can be seen in the picture). This will be flattened out once the texturing is complete. We have never made an fruit-themed weathervane before, so it was very strange today to receive an enquiry for the (possible) commission of an apple and pear! As I sat hammering I started to imagine making a giant strawberry, which led of course to thinking of one of my very favourite children's books James and the Giant Peach...Roald Dahl is brilliant! The studio is currently working on two new weathervanes, with a big push last week to get both sketches enlarged & finalized as full scale drawings. Great for the current apprentice to see the whole process from concept-to-copper. The extra-large apple weathervane should be fun, as the idea is to have one side of the vane showing a "whole" apple, and the other side showing a "half" apple. We have been looking at retro apple patterns to come up with a "punchy", layered design for the apple's core. It's amazing how much character the inside of an apple can have! Because the design is large, the focus on achieving robust volume from the "whole" apple has meant some very aggressive, prolonged blows with a ball-pean hammer (I have the blisters to prove it).The result is a rounded & deeply dimpled shape. 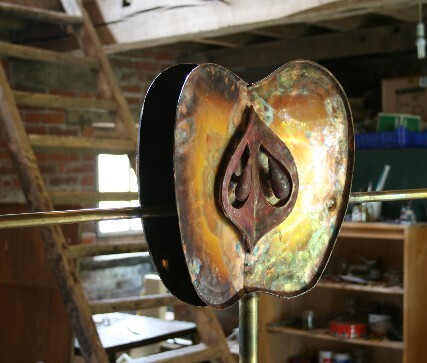 Creating this shape required two full annealings (and two spot annealings) to soften the copper and coax it into shape. The surface will now be smoothed over the course of the next few days using synthetic mallets. Creating the layers on the opposite side will be interesting, as each layer will need to be braced to the mainshaft and reinforced for strength. Hopefully the two little seeds will appear like gems suspended within these layers. 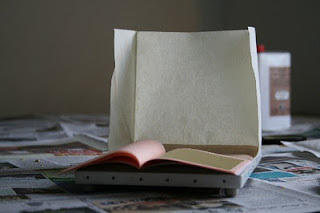 It all proves some of the simplest ideas can be the most challenging! The fully gilt Montagu's Harrier Hawk weathervane was photographed in the moments between torrential rain. The sun even made a rare appearance to dazzle us. Yes, it's a bit wet here in Herefordshire. 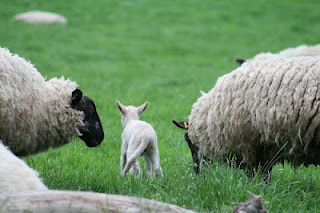 With every break in the rainfall, the animals all get quite frisky, bucking and gambolling and tearing about the place. The birds, the sheep, the pigs, the cows. It's like the picture from the book "Tim Mouse Visits the Farm". Speaking of books...Hay Festival is starting soon. It's always a great line-up, and well worth a visit. If you need accommodation, we have four large, beautiful rooms available and always cook up a lovely breakfast. Today, climbing up Merbach Hill to Neal's Yard Creamery we got some stunning views of the swollen River Wye. The Wye can be quite an ominous river, even when it's not high, although still considered quite "user friendly" (voted England's best river & getting a few mentions in the book and tv programme Wild Swimming). Well, the rooster is cleaned and ready for shipping, commissioned as a present from husband to wife on her birthday. This design is based on the very first motif Gordon and I created as "Greens Weathervanes". At the start of our business, the focus was on designs dripping with detail. Taking out the patterns for something produced over 15 years ago is always a beautiful thing. The drawing and patterns fall out of the envelope like pressed autumn leaves...brittle with age and use. All the patterns from this era are in a similar state, scribbled with notations, delicately folded, yellowing and in some cases held together with tape. Nonetheless carefully packed away and stored for the future. These early designs, the peacock, Alice's White rabbit, the croquet players and this rooster, are the foundations of our business; they planted the seed. The Montagu's harrier hawk is also from this period. Today is the start of the gilding of this dramatic bird in flight. Like the rooster, the Montagu's was commissioned by a husband and wife...but, this time for a double celebration; their wedding anniversary and the birth of their son. Well I guess this article sort of answers my question about "Can pigs herd sheep?" Not that it's an example of a farmer using pigs to herd sheep...only that the owner feels her pig could learn. I have been working on a large Montagu's Harrier Hawk. Most of today was spent making legs and talons. 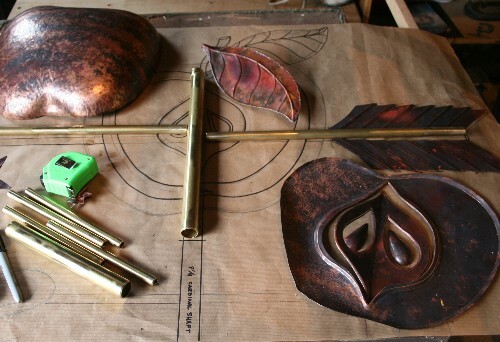 The legs are bronzed copper, and the talons are forged brass. Brazing the different metals together can be very frustrating, as each metal behaves differently under heat. In the simplest terms, brass is brittle and bronze is elastic. 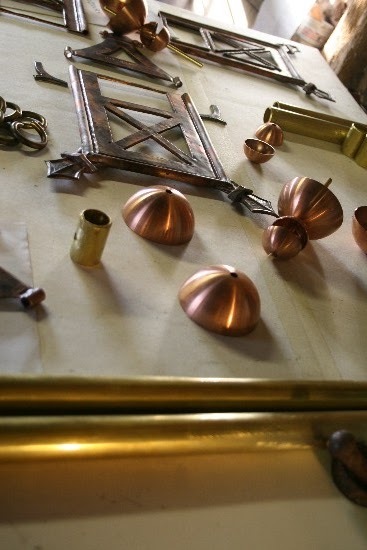 More importantly, when too hot neither the brass or bronze will accept the brazing rod. It's like coaxing a stubborn child. If you linger too long, the brass crawls back on itself like curdled milk, whereas the surface of the bronze gets a sort of glazed skin whilst underneath the metal is actually so mushy it usually slumps with the weight of itself. As the Montagu's is now nearly done, I have left a small hole in the head of the bird, for adding weight for ballast. The talons and legs still need some fine tuning, and the wings and tail need edging, but it's very close. ﻿This stage of construction is a bit of a marathon, with the torches constantly on, and a lot of upside-down brazing and strange, difficult crevices to get the tip of the torch into. Knocking off at 4pm is an absolute necessity when the work gets this intense. So, we have taken to letting the pigs out for a run in the big field every afternoon. They absolutely love the open space & are terribly funny to watch running full pelt with their ears flopping and legs kicked out. Well, funny for us...the sheep aren't of the same opinion. I am sure Trixie (who is the trickster of the three) chases them for the thrill, she even chased the cat today. She has the disconcerting habit of trying to up-end you. The cows find it all a fine distraction from grazing, and come crowding to the fence to enjoy the show. The pheasant and his harem just find it annoying. Someone mentioned farmers using pigs to herd sheep. Is that possible? It would be dreadful if acetylene was phased out, as propane proved a huge frustration when I demonstrated at Art in Action last year. Like baking a cake with a hair dryer. So today was a day of chiselling and shaping on the block. Above are the finished halves of the head, beak and right thigh of a large Montagu's Harrier Hawk. I love the heat patina...that splash of orange and pink and red. Gordon, on the other hand, has been burning paint off a window today. All in preparation for our imminent studio move. We have nearly sourced all the windows for the granary, even if they are a bit of a mish-mash. All the painting, palladium leafing and gilding is complete on the blackbirds commission. 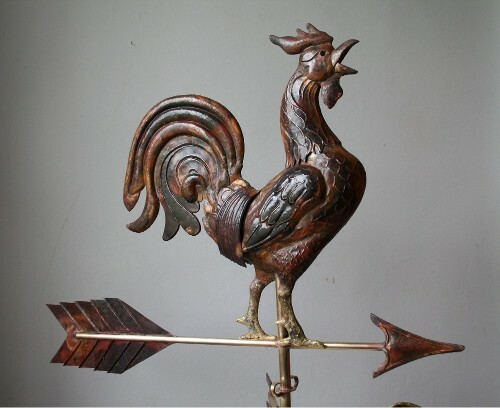 Even the new webpage is poised for publishing, just awaiting the clients receipt of the weathervane. The daffodils and the magnolia are ready to pop in the garden, so it feels like Spring is about to explode on the scene. We are off down to the opening of the Compassionate Eye exhibition at Claverton Manor (the American Museum in Britain). Our trotting Morgan horse and ﻿Montagu's harrier hawk weathervanes have joined the exhibition, which is of some significance to the studio! Hopefully it will be a nice excursion, especially as driving over the bridge at Bristol always reminds me of crossing the Bourne bridge on the way to the ferry in Woods Hole (MA)...ferry boats make me homesick. And then there is nothing quite like driving South to see Springs progress. If the arrival of winter is "the hawk has landed", what would the arrival of Spring be? Last Sunday we drove to Shropshire to pick out three pigs from a litter of Saddleback-cross-Tamworths . There were eight in the litter, and we picked the three "girls"...now named Sally "Sunshine", Trixie and Ginger Nut. It's your job to match each name to the pig, from the picture above. 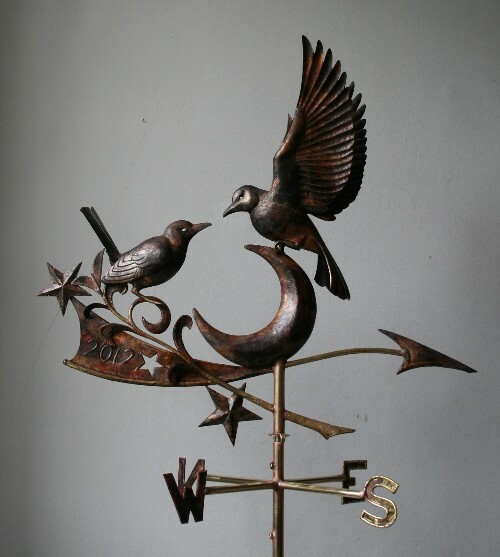 The weekend was spent wrapping a goose weathervane for shipment to Scotland, priming the blackbirds weathervane for palladium leafing, and building a pigpen. Very happy pigs, dashing around in the green grass! Just as we were congratulating ourselves on a job well done, though, who should come wondering into the kitchen but the three little pigs. They must have followed their noses over the field, under the gate, across the lane, straight back into the yard, on in through the back door & into the kitchen. That'll teach us! For all those clients & friends who responded to our request to join LinkedIn, Thank you. 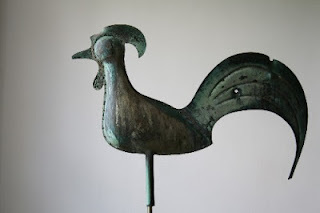 Big news: Two of our weathervanes have been selected to compliment The American Museum in Britain's opening of "The Compassionate Eye: Birds and Beasts from the American Museum’s Print Collection". This exhibition will feature works by some of the great American artists from the mid-20th century. The show will run from 10th March - 1st of July 2012. See the museum's website for more details about the exhibition. 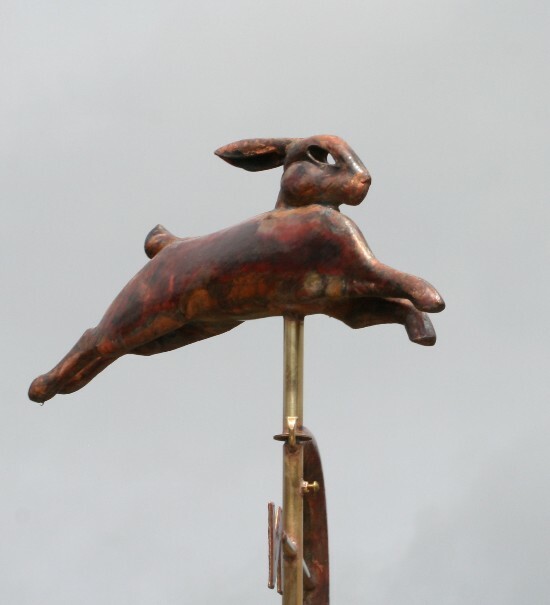 This is a great excuse to visit Bath, see Claverton Manor and view our monumental weathervane of Liberty, commissioned last year by the Museum to celebrate the opening of the new Folk Art Gallery. We have 3 weathervanes in the studio on the go ( as well as several spec peices in preparation for Art in Action): a goose in flight, a barn owl and a quintessential English weathercock. Speaking of weathercocks, here's an antique English one that I adore...look at the true patina on it, and the wonderful rivets & bullet holes in the tail. 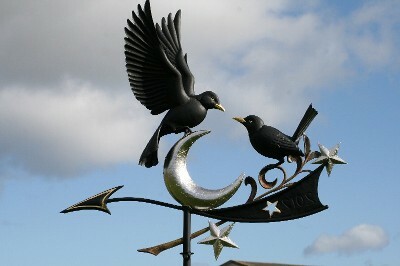 We are working on a pair of blackbirds as a weathervane, as well as a goose in flight. Whilst the blackbirds are a totally bespoke design, the goose is numbered 5 in the series. I really like the goose, and have used it on the homepage of our current website, as well as having had postcards printed, and included it in the brochure. The first goose had a shorter neck and longer beak and sold from Cirencester market (8 years ago?). The the second one (with the beautiful long neck) sold to a diamond heir. Number three, well I would have to look in my files, but number four found a semi-local home a few years back on a gorgeous garage with a bell tower. The Astin Martin convertible in the garage was pretty beautiful, too! The realisation of every design begins with a full scale drawing. Below is a detail of the blackbird design, and next to the drawing is a big pile of (annealed) copper patterns ready to shape. This is a tricky design, as the upper bird with it's wings outstretched is not facing into the wind. I have never seen or made a weathervane of a bird in flight with it's back to the wind...risky business! The ultimate reward will be if it's possible to do without reinforcing the edge of the feathers. We seem to be having a run of Scottish commissions; this time a repeated design from the portfolio. 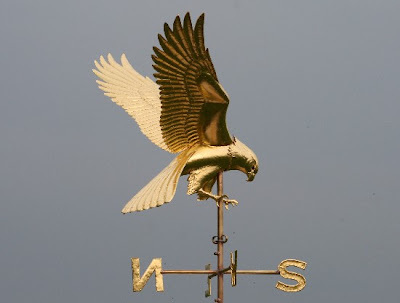 The five original banner weathervanes were completed when the studio was still on Dartmoor, back in 2004. These three new recruits have been commissioned to join the five, as the restoration project on the building is now finally complete. Eight weathervanes on eight turrets...very grand! The banners represent the Scottish flag and included quite a number of small pieces to be assembled, including spun copper balls, rivets and brass rings. I love when the worktable looks this busy. Once assembled and cleaned, they were left out on a glorious day, to dry & then into our "clean" studio for a gilding session. 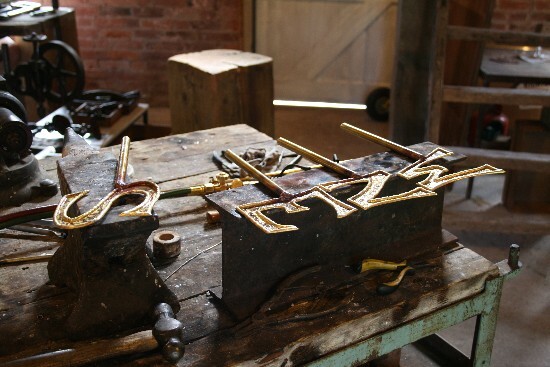 Gordon decided to do a vane a day, which meant preparing the surface the night before, and then gilding for around five hours the next morning. Three full days of gilding...not the funnest weekend, but certainly a productive one!